The easiest way to test your sterilizer. No matter what type of sterilizer your office uses, our biological monitoring service will work for you. 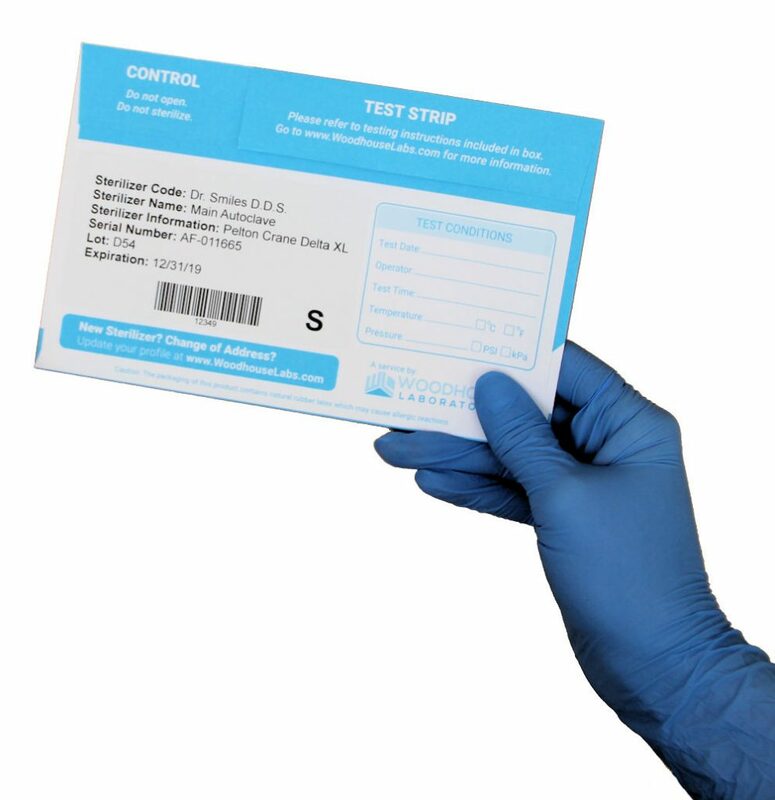 Our complete kits come with pre-labeled envelopes so all you have to do is run one of our biological indicator strips through your sterilizer and then drop it in the mail. We take care of the rest! Results are always at your fingertips. Available online 24/7. Your office is notified immediately of confirmed positives. Let your clients know you care about infection control with a customized certificate. Create an account with us and order as many strips as you need based on the frequency of your testing. We will mail you a test kit that includes everything you need to verify that your sterilizer is functioning properly. Simply place the test strip in a standard run using your normal settings. Once the run is complete, return the control strip and test strip to us in our provided mailer. Spore strip testing is performed by certified laboratory technicians using a full 7 day incubation. An additional confirmation step is included for any unsatisfactory results to reduce the likelihood of false positives. Documentation is provided via email and is always available to reprint from your account. Your office is notified immediately of confirmed positives by both email and phone. Owner-operated laboratory with personal, responsive, and direct customer service. Easy record keeping with results stored securely online. Same day notification of unsatisfactory tests. No hidden costs, everything is included. Have questions? We offer free consultations. Our clients include dentists, oral surgeons, tattoo artists, OB/GYN’s, veterinarians and cosmetologists. "Biological indicators, or spore tests, are the most accepted means of monitoring sterilization because they assess the sterilization process directly by killing known highly resistant microorganisms (Geobacillus or Bacillus species). Mechanical and chemical indicators alone do not guarantee sterilization." "Along with the proper sterilization of instruments and materials, sterilizer monitoring is an essential part of any in-office infection control program." "Biological indicators should be used within Process Challenge Devices for routine sterilizer efficacy monitoring at least weekly, but preferably every day that the sterilizer is in use." "Sterilizer monitoring is an essential part of any in-office infection control program. Third-party monitoring programs may offer more credibility than in-house monitoring." 39 out of 50 states require sterilizer monitoring by dental offices. 37 states require testing on a weekly basis. Click here to see your state's regulations. "Spore tests are the most accepted method for monitoring the sterilization process. Correct functioning of sterilization cycles should be verified by the periodic use (at least weekly) of biological indicators." "Many veterinary practices are actively monitoring their sterilizers using spore tests due to the rising incidence of MRSA (Methicillin-Resistant Staphylococcus Aureas) seen in the veterinary practice." "AAHA Standards for Accreditation require the use of biological indicators for sterilizer monitoring for all types of sterilization processes. When monitoring is not performed, the veterinary surgical facility is not in compliance with the AAHA guidelines." Please contact us, we are happy to assist you.